Please use the form below to make payment for your project. Thank you. All major credit cards are accepted. Click on the corresponding option below that represents the type of payment you are making. 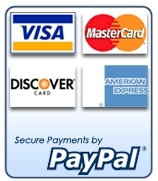 You will be taken to a secure credit card processing page provided by PayPal.